I'm trying to remember my exact stitches for making the purse, but to be honest, I love stitch techniques, but patterns mostly.. well.. I tend to make them up as I go, so this is actually more the technique like my dice bag. I used worsted weight cotton and a size F hook for this, so the stitches are tight enough to not need lining. It's the same thing I use for all my tapestry crochet purses and I've used some of them for years. The rings are macrame/craft type rings, the bracelet sized ones. Yeah.. I use a lot of them, they cost a lot less then handles or bracelet forms. These things run around 40¢ each. You will also need stitch markers. I used pieces of a contrasting yarn. 4 of them. 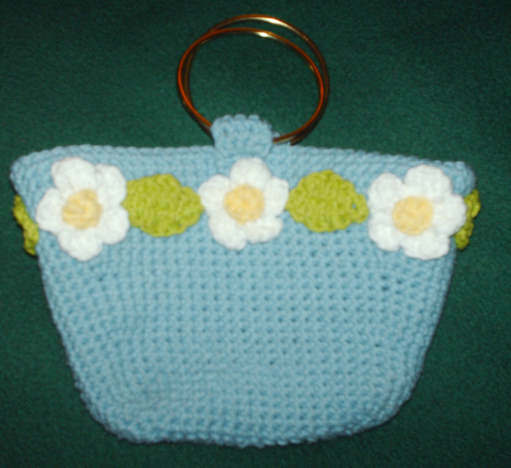 For a purse this size, I used a ball of yarn, a bigger purse will take more yarn, to felt it, you'd use a bigger hook and more yarn. Again, not really a pattern, more the technique. Let's see.. if I recall correctly, I chained 16 and worked 2 single crochets in the second chain from the hook,stitch marker goes in the second sc, sc down side, and sc with stitch marker in the final chain, 2 sc in same chain, sc with stitch marker in same ch, then sc down the side, in the first chain you worked the first 2 stitches in, do on sc with a stitch marker, and then one final sc, slipstitch to join. Chain 1,(does NOT count as first stitch) sc in same stitch, sc in next stitch,move marker and sc in same stitch, sc in same stitch. See? That's the corner and the increases. 3 sc in one stitch with the stitch marker in the middle sc. Crochet down the side to the stitch with the stitch marker and do the same 3 sc thing, moving the stitch marker, et cetra.. you can see where this is going right? So keep increasing rounds making a rectangle until it's the size you want, then do 5 rows plain, moving the stitch marker up each row so you can keep track of where your increases are, then in the 6th row, increase in those stitches and move the markers to the middle stitch in the 3 sc groupings. 5 rows plain, increase. Of course if you want a more subtle angle, you would put in more rows, for a wider angle, less rows. If you keep them regular you will get a nice angled look. Keep going until it's the size you want. Flowers- (if you're curious. There are tons of flower patterns out there) chain 6, slipstitch to join, chain 2, dc, triple, dc, chain 2, slip stitch in ring, repeat 4 times, slipstitch to join to the stitch the chain 2 are coming out of, weave ends in. Contrasting color, chain 2 or use loop method, 6 sc in first ch, slipstitch to join, sew the flower on to the bag with the yarn end of the flower center. Leaf- Chain 6, 2 sc in 2 ch from hook, dc in next 3 stitches, 2 sc, ch 3, sc in final ch, dc in next 3 stitches, 2 sc in final ch, slipstitch to join.